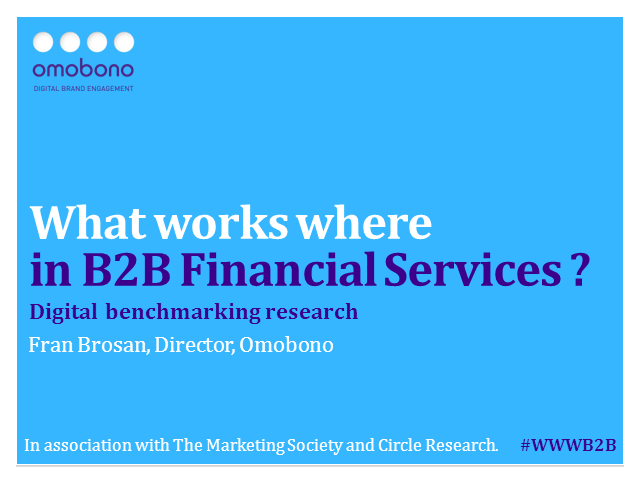 Omobono recently conducted some research amongst senior B2B marketers into ‘What Works Where in B2B Digital Marketing’. Analysis of the respondents showed that a large portion were from the financial services industry, allowing us to draw further conclusions relating specifically to the financial services industry. Attendees can expect to gain an understanding of which marketing goals are considered a priority for B2B marketers over the next 12 months, what channels are considered most effective in achieving these goals, how their budget will be spent and what metrics are used to measure ROI. Alongside general findings from all respondents, we will outline specific findings relating to financial services marketers, including which responses differ from ‘the norm’ and which stand out.